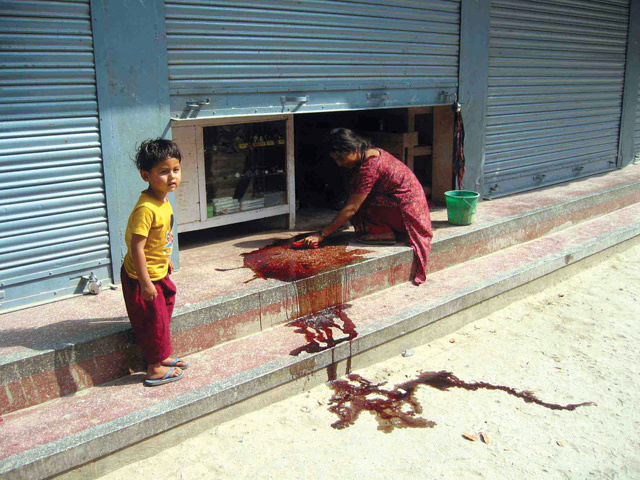 LIVES AFTER WAR: Thomas Bell’s photograph of Jamila Khatun washing blood from her shopfront while her three-year-old daughter Sajita watched, became an iconic image of the conflict. 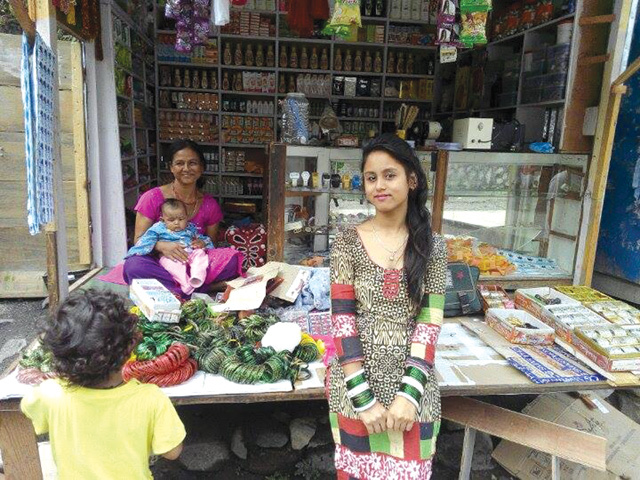 Jamila Khatun and her three-year-old daughter, Sajita, were preparing to sleep in a room above their bangle shop on Beni’s market street. Her husband was not home. It was 20 March 2004, and at about 10 pm she heard the sound of many running footsteps outside. Soon after, there was a deafening explosion from the direction of the Army base, followed by gunfire, more big bangs, and people shouting commands and screaming. The firing continued throughout the night. Their house shuddered and the window panes rattled with every explosion. Jamila had to muffle her daughter’s cries as they cowered under the bed. She did not have the courage to peep outside, and stayed awake all night, praying for their lives, and for daylight. Jamila and Sajita Khatun visited the A People War Travelling Photo Exhibition when it arrived in Beni in 2008 . The next morning, hours after the firing had stopped, there was a sound of helicopters overhead. Jamila was still hiding in the room, her daughter fast asleep, when someone hammered on the door. Soldiers were asking the residents to come out of their houses. The Maoists had already fled. Jamila stepped outside, blinking in the sunlight, her eyes swollen and red. She still remembers vividly the scene that greeted her that morning: blood, bullets and bodies. The District Administrative Office building had been reduced to rubble, and was still smouldering. The streets were strewn with spent ammunition and unexploded bombs. The steps outside Jamila’s shop had fresh blood from a dead female guerrilla, and she got a bucket of water to scrub it clean. Her daughter was standing nearby watching her, when journalist Thomas Bell walked by. Sajita Khatun, 15, looks on from her mother's shop at the same spot where they had been photographed in 2004. Bell — then with the Daily Telegraph in Kathmandu — was one of the first outside journalists on the scene (see box) and what he saw is described in a dramatic eyewitness account in Nepali Times issue #189. Bell’s photograph of Jamila and her daughter, and blood flowing into the dusty street, is one of the iconic images of the conflict that lasted ten years and had claimed 17,000 lives by the time it ended in April 2006. The photograph was included in Kunda Dixit’s A People War book, and was part of a travelling photo exhibition that visited 45 of Nepal’s 75 districts from 2008 to 2009. 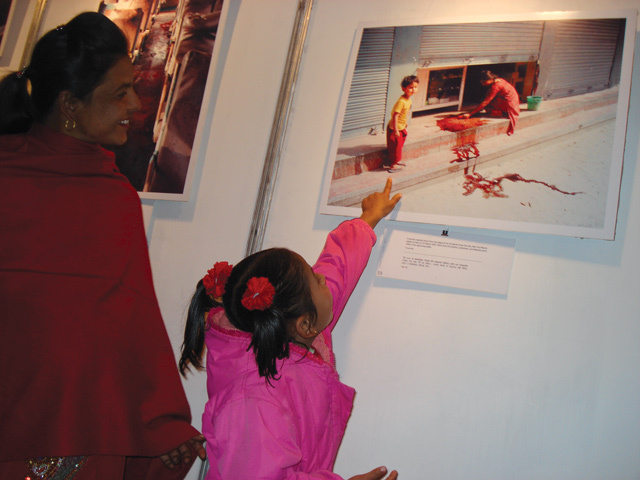 When the exhibition arrived in Beni in 2008, Jamila and her daughter were there to see their own photographs for the first time. Sajita is now 15 and in Grade 9 at a local government school. Her memories of that night and the day after are derived mostly from what she has heard from her mother and neighbours. But she does remember seeing blood and bodies, and being scolded by an army soldier. She understood later from her mother that the soldier had snatched away an unexploded pipe bomb from her friend, shouting angrily at her. She is now thankful to that solider who saved her life. Not much has changed in the lives of the Khatuns since then. They now live in a small house in a landless squatter settlement near Beni. Jamila still sells bangles in the same shop where she had hidden during the Beni battle. The country has gone from war to peace, from monarchy to republic, and there is a new constitution, but none of this seems to have made a difference to the Khatun family or others like them in Beni. I arrived in Beni the day after the battle. Bodies of Maoist attackers were still lying in the streets, the police and army were carrying their casualties down to the helipad, and the townspeople were standing around, staring. I had been there for several hours doing interviews, and was being hurried along to meet someone or see something, when this scene caught my eye. It was such a striking image. I snapped the picture without even stopping. I was still walking so it is lucky the picture isn’t blurry. The famous bullet-ridden telephone pole that survived the Battle of Beni is now a peace monument at Yala Maya Kendra in Patan. In 2004, the war was at its height and the Maoists had been attacking one district headquarters after another. The tactic was to lay siege to the town at night, destroy the district administration buildings and attack the army and police bases, to inflict maximum damage and injury. The attacking force conscripted villagers and often used them as human shields in order to compel the defenders to expend all their bullets. Even though the Maoists would suffer heavy casualties, the battles would expose the government’s vulnerability and be a propaganda victory. An estimated 5,000 Maoists and villagers were involved in the Beni attack, most of them women. The clash lasted from 10:30 pm on 20 March 2004 until 6 am the following morning, after which the Maoists retreated with Army helicopters in hot pursuit. 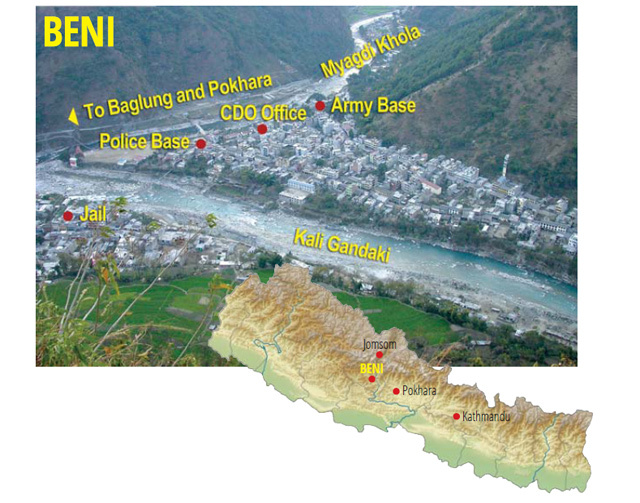 In all, 19 civilians, 17 police and 14 soldiers were killed, but hundreds of Maoists were also slain, many buried by the rivers when helicopters strafed guerrilla columns as they marched back to the mountain passes of Rukum. The Battle of Beni also marked a turning point in the conflict, as the Army bolstered the defence of its garrisons in district towns, and the Maoists shifted to ambushing security convoys along the highways. 'A People War', published in 2007.